Sushi King. A name so familiar to all Japanese food lovers out there, the brand that familiarized us Malaysians to sushi on kaiten (the moving conveyer around the restaurant), which are freshly served daily. Not only they serve us high quality and delicious Japanese cuisines, they also serve us affordable meals, that is kind of hard for a Japanese eatery to do, for absolute honesty. They have around 100 outlets in Malaysia and still growing! That’s the proof right there on how much we love Sushi King. This writer being a Japanese food fanatic, was given the opportunity to sample some of their latest and best offerings, so I grabbed onto it. When we entered the Sushi King outlet in Sunway Pyramid, the familiar ambience of Sushi King, welcomed us, with the staff all wishing “Irasshaimase!” (いらっしゃいませ! ), meaning “Welcome to the store!” or “Come on in!”. When we were seated, we were presented with some delicious beverages that are truly unique to the taste buds. The one that attracted us the most is the ginger soda that was made using the pickled ginger. That first sip was so refreshing and sweet with a wee hint of heat from the ginger. It’s just like taking a bite of pickled ginger to cleanse your palette before moving onto the next dish. Perfect! We were then served the Norwegian Salmon Sashimi; cold, generous cuts of raw salmon that tasted so fresh and delicious in each bite we took. For any sashimi lover, this would be the ultimate salmon sashimi taste that they seek for. We also tried the Salmon Sushi. This is the perfect dish for those who are not ready for a full-on sashimi dish but would like to try the freshly flown in Norwegian Salmon. We moved on to the Tropical Roll. 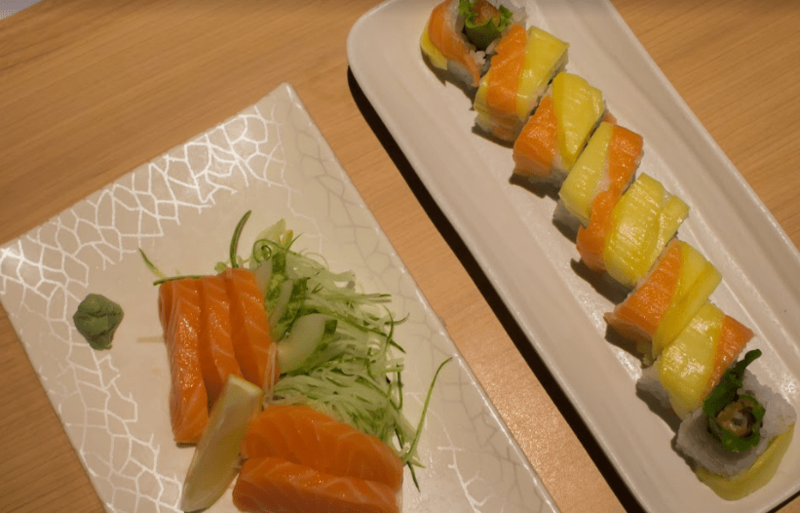 This is a delicious sushi roll that is made of deep-fried prawn and lettuce, which is covered with thin slices of fresh raw salmon and sweet yet tart mango with a dollop of flying fish roe and mayonnaise to top it off. This sushi tasted new and delicate as the mango and lettuce combined with the fried prawn and salmon gave a beautiful harmony of taste true to its name, perfect for those who want to feel like they’re in Hawaii. We then sampled the Chicken Nanban, which was the dish that surprised me the most. The deep-fried chicken with a side of lettuce and cherry tomato, topped with a unique-tasting tartar sauce, did not taste how it looked. The sauce was the main surprise factor; although it looked like a traditional tartar sauce, it does not taste like that at all. Though the basic creamy and tart taste was present, another peculiar yet tantalizing taste was also present, making this sauce too unique to not stop one from pondering what magic was used to create this. We then tried the Salmon Avocado Carpaccio. 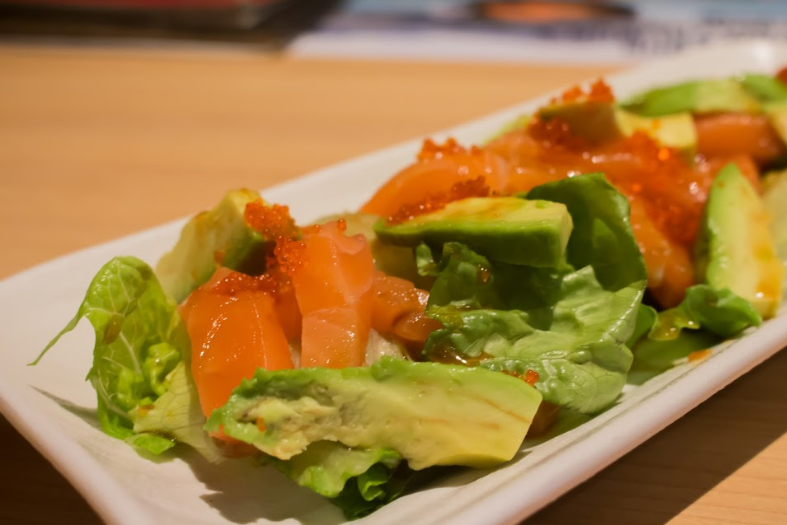 The creamy and buttery avocado with slices of fresh salmon with some crisp lettuce and flying fish roe, drizzled with wafu dressing and mayonnaise was the most satisfying salad we have tried in a Japanese eatery. Again, the dressing used in this dish was so delectable that we couldn’t stop till we finished the entire plate. Though the Chicken Nanban and Salmon Avocado Carpaccio are not for delivery, it is still worth every part of the journey you take to try it in stores, trust me! We were then served with soft shell crab tempura, that is the best kind of tempura out there! 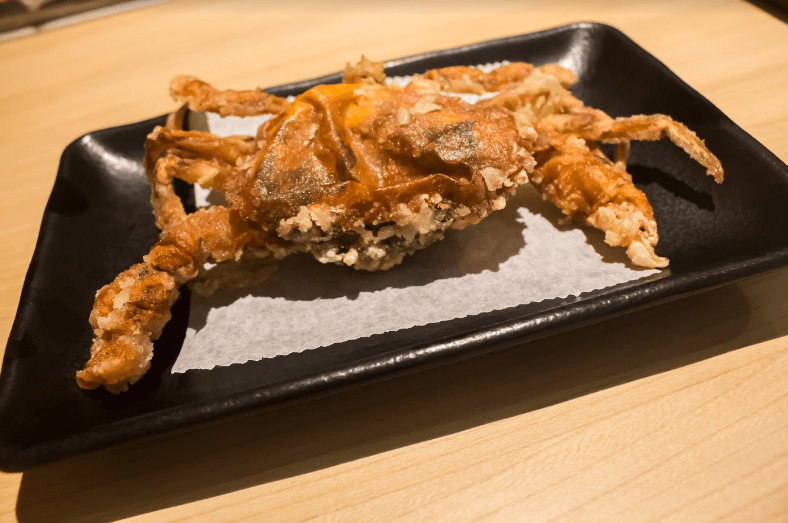 All seafood lovers’ dream tempura, this soft-shell crab was salted to perfection contrasting the sweet juicy flesh of the crab, giving the perfect combination. Then we were served the Mixed Bento. In this ‘bento’ there were deep-fried salmon and chicken, served with the classic edamame salad, a crabstick and fried fish cake. That was certainly a mouthful. 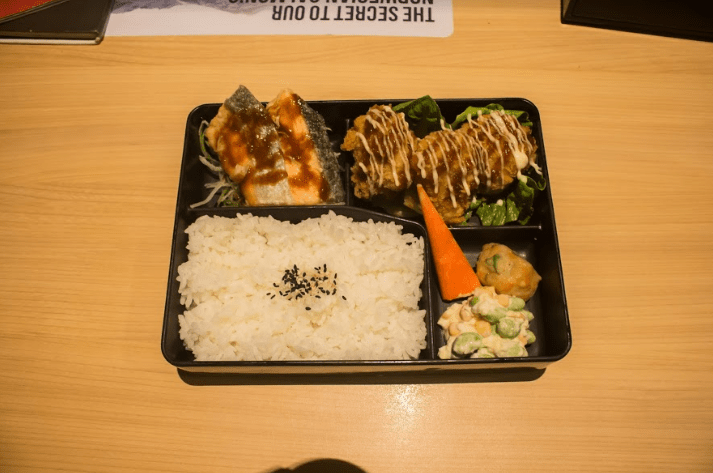 This is the perfect lunch bento; a signature move of Sushi King, I must say. They perfectly blend the modern Japanese cuisine while maintaining the traditional value of each dishes. We also got to try the Crispy Salmon Skin. For all the salmon skin lover out there, this dish is not only crispy and seasoned perfectly, it is also served with the sweet condiment that is unique and goes perfectly well with this dish. Thanks to the latest beef promotion by Sushi King, we got to sample the Yaki Gyu Don and the Spicy Beef Roll. The Yaki Gyu Don is the rice dish topped with pan seared beef drizzled in BBQ sauce. Made with 100% fresh Australian beef, the meat was tender and sweet with a hint of BBQ flavor perfectly blended into the savory flavor of the beef. 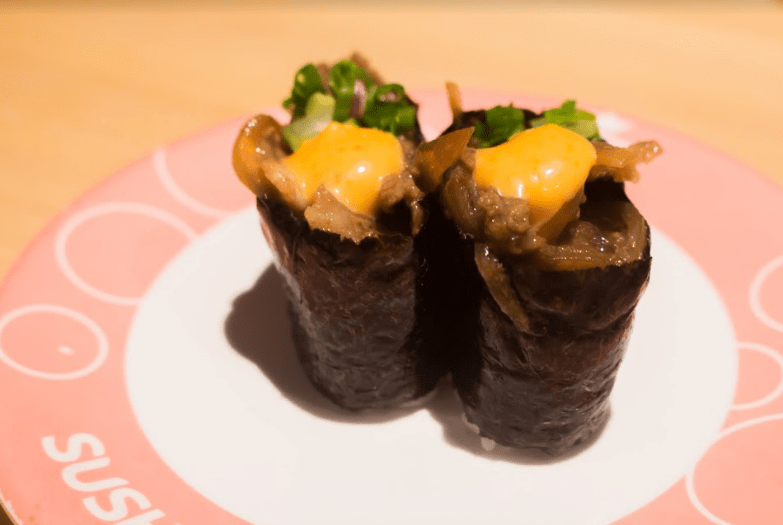 The Spicy Beef Roll, made from pan friend beef topped with spicy mayonnaise sauce that is not too spicy and some flying fish roe on top, is the a truly satisfying beef sushi perfect for all the meat lovers out there. There are many more ‘Yaki’ dishes offered by Sushi King and you better hurry to taste them all, as the promotion ends soon, on 31st December 2016. Sushi King is also offering its patrons the “Where’s The Cow Contest” among many other; so you better hurry and participate to win many exciting prizes. Which reminds me, I better submit my participation now! Click here to order online from Sushi King.